I have a bit of an aversion to books on apologetics. I don’t know exactly why this is, but it may be that many of them seem to teach methods of defending the faith that either manipulate or bludgeon. Somehow grace and apologetics do not seem to go together as they ought. 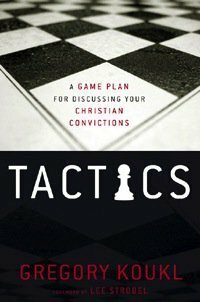 So it was with perhaps just a bit of reluctance that I began reading Gregory Koukl’s Tactics: A Game Plan for Discussing Your Christian Convictions. This is a book that promises to teach a new method, a respectful method, of defending the faith and of attempting to convince others of the truth of Christianity. This is not an apologetics 101 text, as in a book that will compare and contrast various apologetic methods; instead, it is a guide, a book that seeks to lead the reader into a new method of sharing his faith with others. This tactical approach is a useful one, for it allows you to stay “in the driver’s seat in conversations, so you can productively direct the discussion, exposing faulty thinking and suggesting more fruitful alternatives along the way.” It is important to note that “tactics are not manipulative tricks or slice ruses. They are not clever ploys to embarrass other people and force them to submit to your point of view. They are not meant to belittle or humiliate those who disagree so you can gain notches in your spiritual belt.” Instead, they are ways of guiding a conversation to expose poor reasoning and then use that as a bridge to the truth. Koukl begins by looking at three basics skills the Christian will need if he wishes to be an effective apologist. First, he must have knowledge, having a familiarity with the central message of the Bible; second, he must have knowledge that is tempered by wisdom that makes his message clear and persuasive; third, he must have the character of a Christian, embodying the virtues of the kingdom he serves. Then, over the course of four chapters, Koukl unveils his tactic. He calls it “The Columbo.” The key to this tactic is to “go on the offensive in an inoffensive way by using carefully selected questions to productively advance the conversation.” Never make a statement when a question will do the job. When you ask questions and listen carefully, you gather information that can be used to show a person where his thinking is faulty. Questions can be used to gather information, to reverse the burden of proof or to lead the conversation. Either way, the person asking the question is the person who leads the discussion. In Part 2 of the book, Koukl offers guidance in finding flaws in the way people reason. He offers specific tactics to unveil poor reasoning and to turn it back against a person. He calls these things like Suicide, Sibling Rivalry, Taking the Roof Off. He offers advice on countering the human steamroller (you’ve tried to discuss issues with people like this) and the Rhodes scholar, the supposed expert. Apologetics is not always a discipline that is done with grace. But in this book Koukl shares tactics that will prove beneficial to any Christian. They may just revolutionize the way you interact with unbelievers. I highly recommend it.